On the same day Hart House opened its doors to the public 94 years ago, the cornerstone of the Soldier’s Tower was laid to commemorate members of University of Toronto who lost their lives in the Great War. Finished in 1924, the tower is Canada’s second tallest war memorial after Ottawa’s Peace Tower. The tower is now dedicated in the memory of the 1,185 individuals who did not return home from both World Wars. 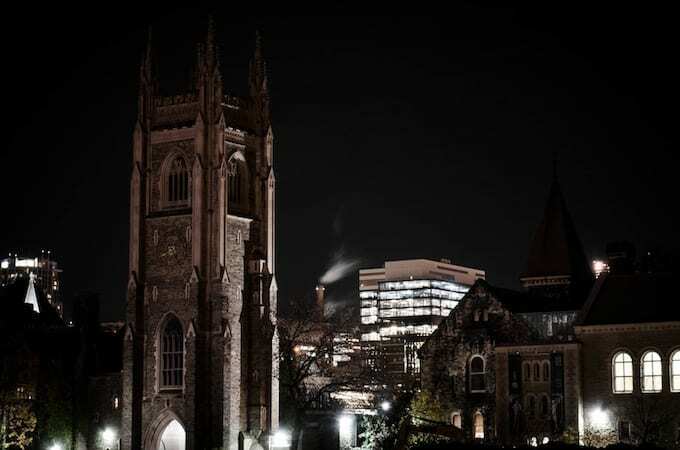 Designed by the same architects of Hart House, Henry Sproatt and Ernest Rolph, the Soldiers’ Tower is a focal point of the St. George campus. Built with grey ashlar stone and trimmed with limestone, the tower houses a mechanical clock along with a carillon consisting of 51 bells. 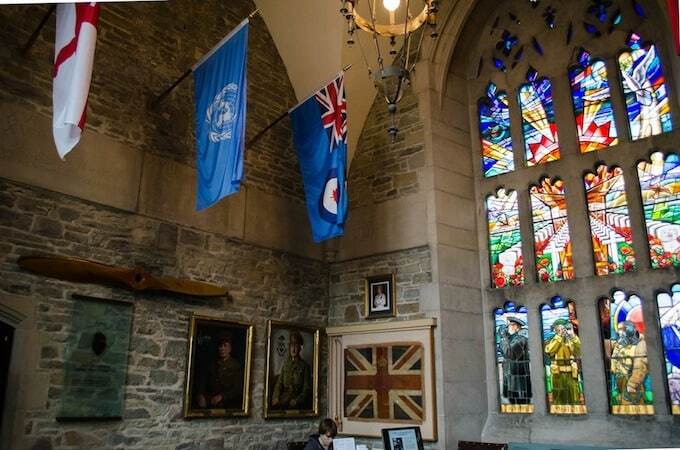 Open to the public, the Memorial Room sits directly above the archway and contains many artifacts focused on University of Toronto’s involvement with wartime service during the Great Wars. Along with the engraved names of the men and women who lost their lives, the tower stands as a humbling reminder to how the sacrifices of the past protected many of the freedoms Canadians still enjoy today. The Memorial Room houses mementoes of the wartime service from students, staff, faculty and alumni. 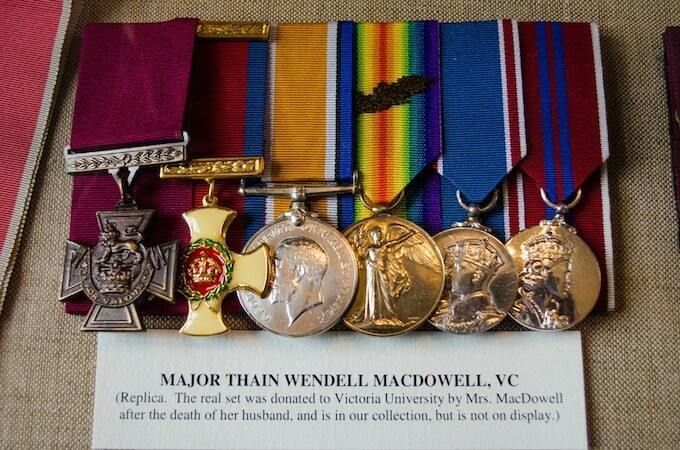 Medals, memorial books, portraits, photographs and flags provide a glimpse into the past. The most noticeable feature of the Memorial Room is a twelve panel stained-glass window commanding the entire southern wall. 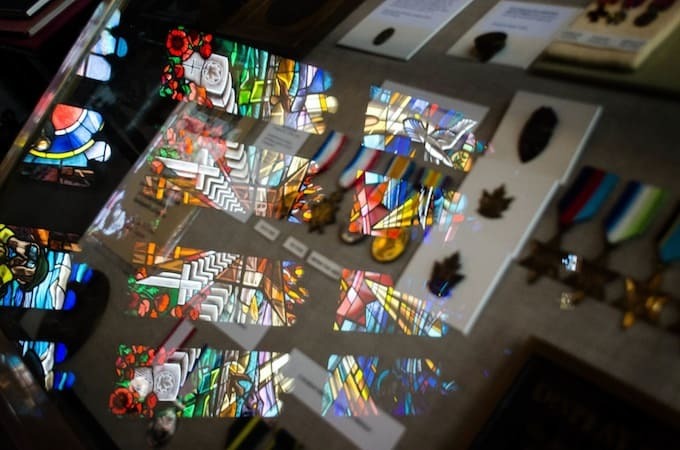 Based on John McCrae’s poem “In Flanders Fields”, the window was commissioned and dedicated in 1995. Sitting below the Memorial Window is a German machine gun. 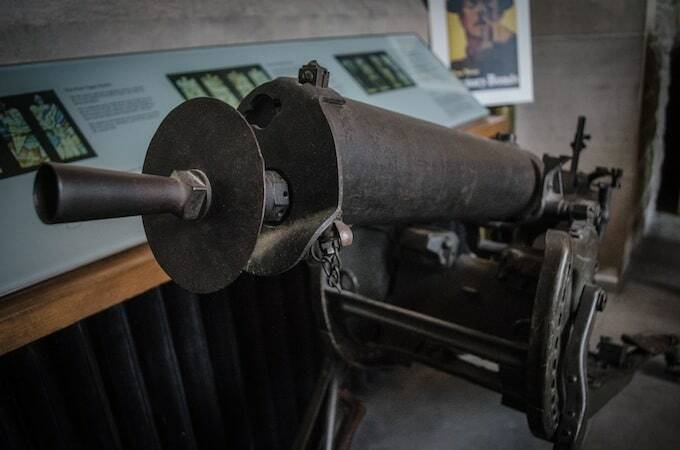 During the battle of Vimy Ridge Major Thain MacDowell, a student at Victoria College, and two others were out scouting the surrounding land alone when they stumbled across an encampment of two machine gun nests manned by 77 German soldiers. MacDowell managed to convince the Germans that the main army was arriving soon to attack leading the Germans to surrender. 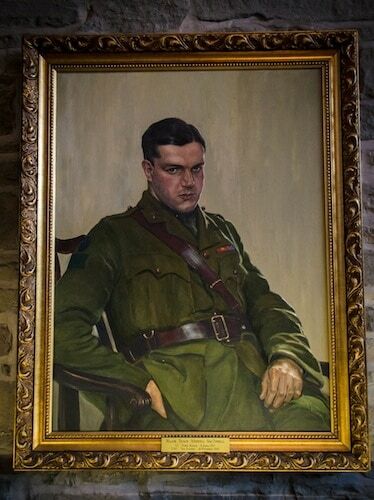 He was one of two individuals from the university to receive the Victoria Cross, the highest possible military decoration one can be awarded. The clock in Soldiers’ Tower is particularly special — it is one of the few remaining working artefacts from its time period. Built by the British firm Gillett and Johnston, which also supplied the first 23 bells, the clock has the potential to continue running indefinitely. 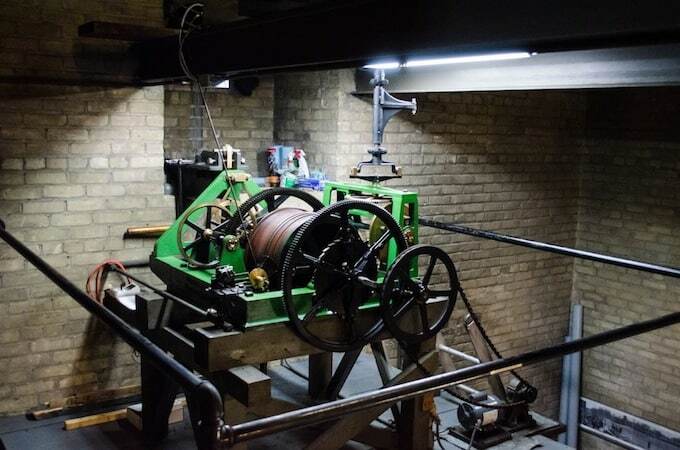 The tower has two clock faces, on the north and south facades, both driven by this clock mechanism. Recently the four gothic spires on the tower were rebuilt; over 80 years of wind and weather were pushing the spires out of position! 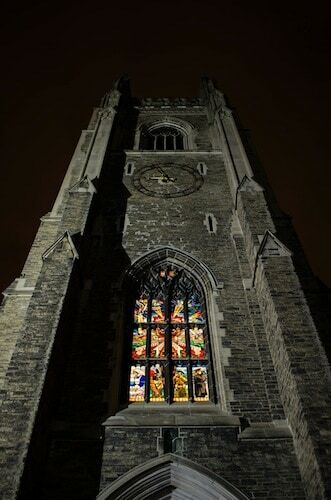 It was promised that there would always be a place of honour for the fallen at U of T, and through generous donations and fundraisers the Soldiers’ Tower is able to remain that place. 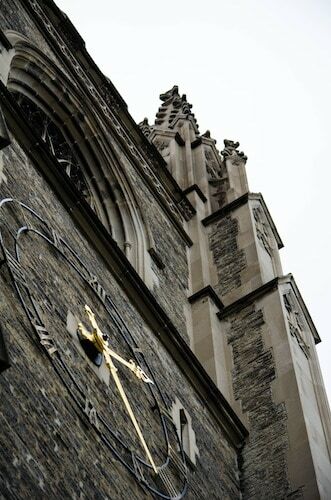 The tower originally contained 23 bells, donated in memory of those who lost their lives in the Great War. 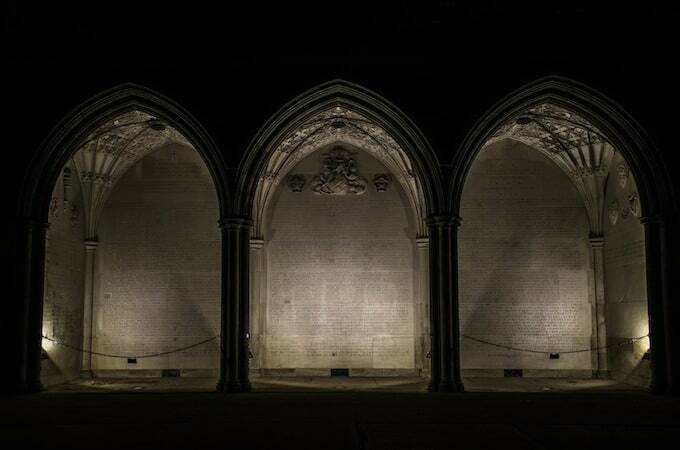 These dedications are engraved high in the walls of the Memorial Room for each bell. 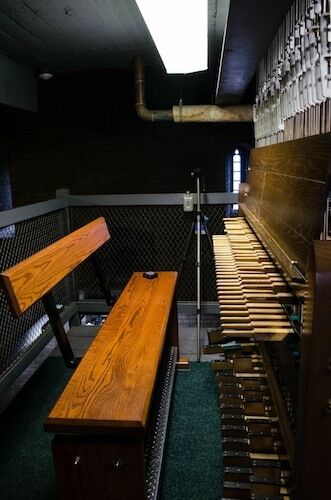 The bells are played using an organ-like console called a carillon, with the bell ringer depressing pedals and pegs that in turn control the movement of iron hammers that strikes a particular bell to producing a note. After the Second World, War an additional 28 bells were donated to the tower; however these bells were out of tune with the original bells. 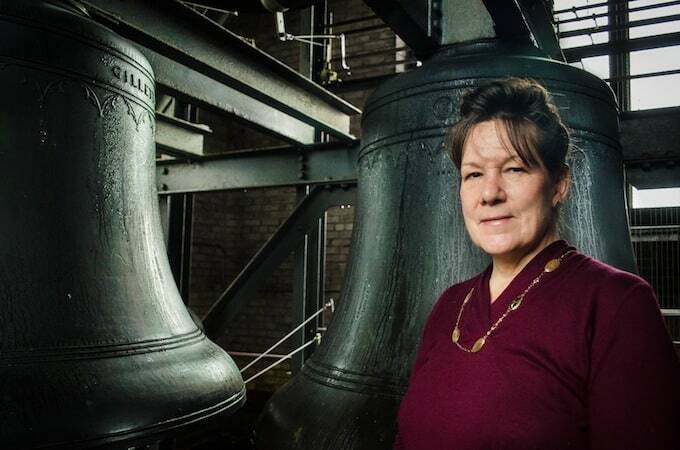 The bells were eventually replaced and in 1976 the current 51-carillon was rededicated. 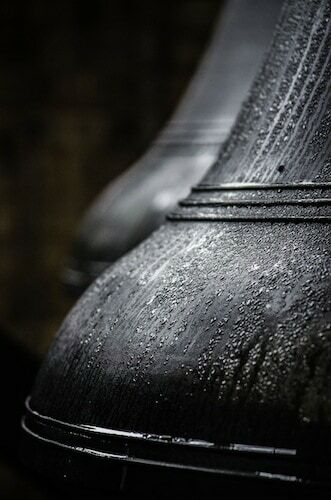 Cast in bronze, the 51 bells span four octaves and range in weight from only 23 pounds to four tons. One can hear the Tower Carillon play during special events such as convocation and Remembrance Day ceremonies. 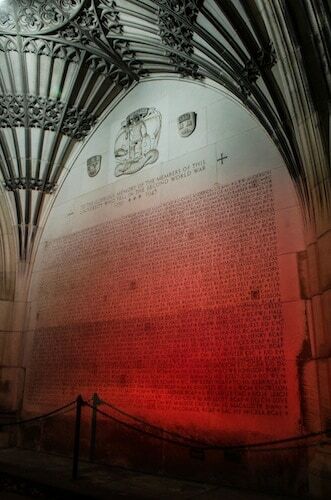 Bridging the gap between University College and the Soldiers’ Tower is the Memorial Screen, displaying the names of the 627 who died in the First World War. Students walking under the tower through the Memorial Archway pass by the engraved names of the 557 university members who lost their lives in the Second World War. Every year on Remembrance Day wreaths are laid within the Memorial Screen in remembrance of the sacrifices made by those to protect the freedoms enjoyed in times of peace.